The Division of Mathematical, Natural, and Applied Sciences was founded in 1945. It has undergone a number of reorganisations. 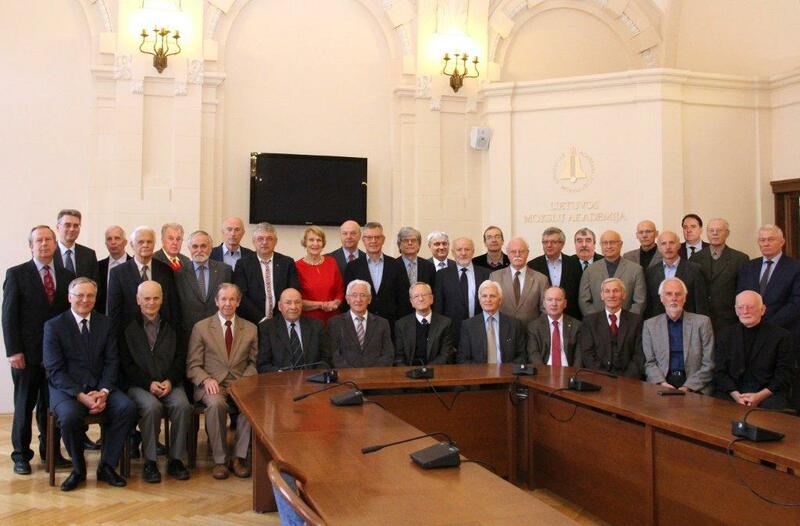 In 1990, the Division of Physical, Technical, and Mathematical Sciences was reorganised into two divisions; the addition of chemical sciences completed the reorganisation of the division that at the time was put in charge of Prof. Algirdas Šileika. In later years it was headed by Henrikas Pragarauskas, Valdemaras Razumas, and Feliksas Ivanauskas. Currently, the division is headed by Prof. Leonas Valkūnas. With 27 full members, 10 members emeriti, and 16 foreign members (including Prof. Zhores Alferov, who was awarded the Nobel Prize in 2000), the Division of Mathematical, Physical, and Chemical Sciences is the largest in the Academy of Sciences. The work of the division is organised in three sections: mathematics (chaired by Remigijus Čiegis), physics (Juozas Vidmantas Vaitkus), and chemistry (Ričardas Makuška). The first mathematician to be elected a full member of the Lithuanian Academy of Sciences in 1962 was Jonas Kubilius, who was later followed by Vytautas Statulevičius and Bronius Grigelionis. These three outstanding scientists raised a large group of disciples and formed the Lithuanian school of the probability theory. Other branches of mathematics were also developed by the members of the division. Significant results have been achieved in the fields of differential equations and numerical mathematics. Professors Adolfas Jucys and Povilas Brazdžiūnas were the first in the physics section to shape the main research trends in this field in Lithuania. Later, professors Paulius Slavėnas, Juras Požela, Jurgis Viščiakas, Zenonas Rokus Rudzikas, and Algis Petras Piskarskas continued research into physical problems that included almost all branches of physics. Results achieved in atomic and molecular physics, semiconductor physics, photometry of stars, nonlinear optics and spectroscopy, and laser physics have brought global recognition to the Lithuanian school of physics. Professors Juozas Matulis and Jonas Janickis formulated the first fundamental trends of research in the section of chemical sciences. Later the thematic field expanded to include all main branches of chemistry. Significant results have been achieved in electrochemical and chemical precipitation of metals, organic synthesis, inorganic and analytical chemistry, polymer synthesis and analysis, and biochemistry. Members of the division carry out expert work and take part in the commissions and expert groups of the Lithuanian Research Council and the Ministry of Education, Research, and Sports. They are members and experts on the councils, committees, and commissions of the European Union and other international organisations, as well as reviewers of projects and reports of state research programmes, and of works and projects submitted for various competitions. They also participate in the work of the commission of the Lithuanian Science Prizes.